← How effective will the Austrian People’s Party be in Government? Ireland’s 2016 General Election produced one of the most fragmented and disorganised parliaments in the country’s history (O’Malley, 2016, p. 255). With the outgoing coalition government of Fine Gael (FG) and the Labour Party (LP) not returning government, there were now over four thousand possible permutations which could form a government. The key factor behind this number of potential possibilities was the loss of seats by the LP, who had been the minority party in the FG-LP coalition. This loss was larger than generally predicted and there was no clear transfer to another party, thus leaving the vote split amongst several smaller parties and Independent members of parliament (TDs). Another factor which heavily influenced the speed of government formation in 2016 was the size of the largest returning party, FG. The FG party now held just under a third of the seats in parliament, compared to the 45% they held in 2011. This absence of a strong returning government or pre-determined coalition resulted in a seventy-day period of government formation, which was fifty days longer than the usual length of government formation in Ireland. This brought the Dáil more into line with its European counterparts such as the Dutch or Austrian parliaments (O’Malley, 2016, pp. 259-260). From the two variables of fragmented vote share and size of the largest party a measure can be derived of how difficult the formation of a stable government may be, called the ‘Index of Coalition Difficulty’ (ICD). Coined by Professor Eoin O’Malley of Dublin City University, this measure quantifies the difficulty faced by prospective government parties in forming a coalition by measuring the number of other parties with which a coalition can be formed, and the seat threshold required to form a stable government, just over fifty percent of the seats in a parliament (O’Malley, 2016, pp. 260-261). Given the complexities described in the ICD, the formation of the 2016 Irish government was subject to a protracted and contested negotiation process. These coalition negotiations centred on a mix of what are known as Ex-Ante and Ex-Post modes of bargaining. These Ex-Ante and Ex-Post systems are used to prevent agency loss during the formation of a government, essentially locking in the actions coalition partners, binding them to their agreements in one of two ways. In an Ex-Ante bargaining system, the prospective government’s policy programme is outlined in detail and as many conflicts as possible between partners are resolved from the outset. This form of negotiation provides comprehensive initial policy arrangements and a standard by which all members of the coalition must abide, with individual ministers committed to specific policy outcomes before taking office (Strom & Muller, 2008, p. 182). While this system provides a strong policy platform for members of a coalition, it requires much more detailed negotiations on contested policy areas prior to reaching an agreement. Contrastingly, the Ex-Post system of bargaining involves setting relatively few policy goals initially, while simultaneously devising more complex methods for solving policy conflicts as they arise. Authority is not invested in a detailed policy arrangement which must be adhered to, but often remains in the hands of the coalition leaders, who may retain veto powers over government decisions. One key facet of the Ex-Post system is the importance of ministerial appointments, particularly that of ‘Junior Ministers’, who hold authority for a subsection of a government department. Such roles are often awarded to a member of a party different to that of the senior Minister (Strom & Muller, 2008, pp. 182-183). One issue faced when utilising the Ex-Post system is the lack of clear policy direction at the beginning of a newly formed government’s tenure. Another is the faith which must be vested in other leaders within the coalition given their veto powers. A balance of the Ex-Ante and Ex-Post modes of bargaining was required after the 2016 Irish General Election. Following a drawn-out debate with the different parties in the Dáil, FG established an 1800-word agreement with Fianna Fáil (FF), the second largest party since the 2016 election. While this was not a coalition in the normal sense, it was an example of the Ex-Ante system at work, with FG and FF establishing the detailed policy programme of a prospective FG minority government. Such an agreement included guidelines for supporting budgets, cabinet appointments and the protection of FG by FF from any potential votes of no confidence. This agreement also allowed FF to establish itself as the main opposition to the minority government it had agreed to support, allowing for policy proposals and bills in line with its own election manifesto commitments (Kelly, 2016). Despite this agreement, further negotiations were required with Independent TDs, who were not attached to any party, but collectively held a considerable share of seats. This provides an example of the Ex-Post system of negotiation at work. When these negotiations concluded, the importance of Junior and Senior Ministerial appointments was clear. In total, six Independent TDs were given ministerial portfolios, equally split between Senior and Junior positions (Merrion Street (Irish Government News Service), 2016). These TDs contributed their own interests to the agreement between FG and FF, resulting in a relatively inconsistent document (O’Malley, 2016, p. 270). While the Ex-Ante agreements between the two largest parties held firm, there was now a much larger pool of those vested with veto powers and control over specific government departments, as is typical of the Ex-Post system. In conclusion, the 2016 Irish General Election and subsequent government formation highlighted a change in both the Irish political system and the general populace between 2011 and 2016. As noted previously in the study of Irish politics, the broader picture for the modern Irish party system and government formation is one of fragmentation (Barrett, 2016). FG and FF currently hold 56% support in recent polling, a position not seen since before the 2011 General Election (Colwell, 2017). However, despite the renewed strength of the two main parties, the precedent set by the 2016 government formation of both Ex-Ante policy agreements and Ex-Post ministerial appointments will have a significant influence on the formation of any subsequent Irish coalition government. Barrett, D., 2016. Irish general election 2016 report: whither the party system?. Irish Political Studies, 31(3), pp. 418-431. O’Malley, E., 2016. 70 Days: Government Formation In 2016. In: M. Marsh & M. Gallagher, eds. How Ireland Voted 2016: The Election that Nobody Won. London: Palgrave Macmillan, pp. 255-276. Strom, K. & Muller, W. C., 2008. Cabinets and Coalition Bargianing: The Democratic Life Cycle in Western Europe. Oxford: Oxford University Press. 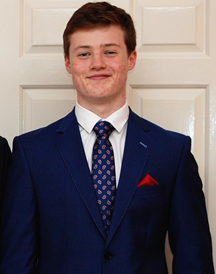 Stephen Crosby is a third-year undergraduate student studying a single-honour Bachelor of Arts degree in Politics & International Relations at UCD. Stephen’s research interests include parliamentary party systems, specifically the Irish and European governance systems. In June of 2017 Stephen was selected, on behalf of SPIRe, to present a research paper on the impact of Brexit on UK and EU Erasmus students at the Universitas U21 Undergraduate Research Conference. This blog post was written as part of his coursework for POL30540 Parties in Parliament. This entry was posted in UCD SPIRe students and tagged elections, electoral politics, Fianna Fail, Fine Gael, Irish government, Labour Party. Bookmark the permalink.